I used to watch those Eat Street programs from one of those popular channels and go crazy after seeing those burgers with hell lots of fillings, choice of chicken, lamb, pork, beef etc. Not to forget those generous fillings of mayonnaise, cheese and their secret ingredients. The weird sound that the anchor does after having that first bite of that burger – I would have booked a ticket to that exact location if my bank balance was enough to not to get exhausted for couple of years. What is that Eat Street? If I am not wrong, the Eat Street was a program in one of the television channels. The program showed the best street foods around the world, especially the junk foods or fast foods you may call it. 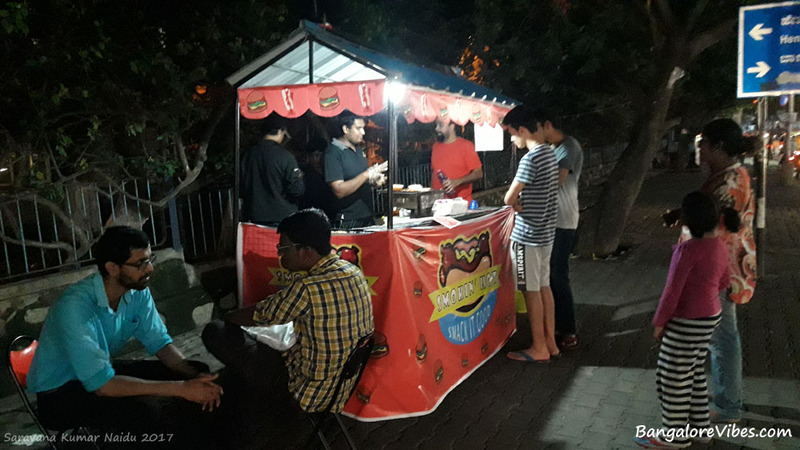 Eat Street has become synonym to the Street Food now. There are highest number of street food vendors in India when compared with any other country. This is my personal opinion considering the liberty one has to sell food from anywhere provided the vendor has good relationship with the authorities. Bengaluru is no less a place for popular joints for varieties of portable vendors. For example, the Kammanahalli main road in Bengaluru throws out surprises every other day with new food joints. Some sustain for several years and some for several days. I would have seen this burger stall at least two times before I decided to taste one here. You will not believe I have already come here for three times now. 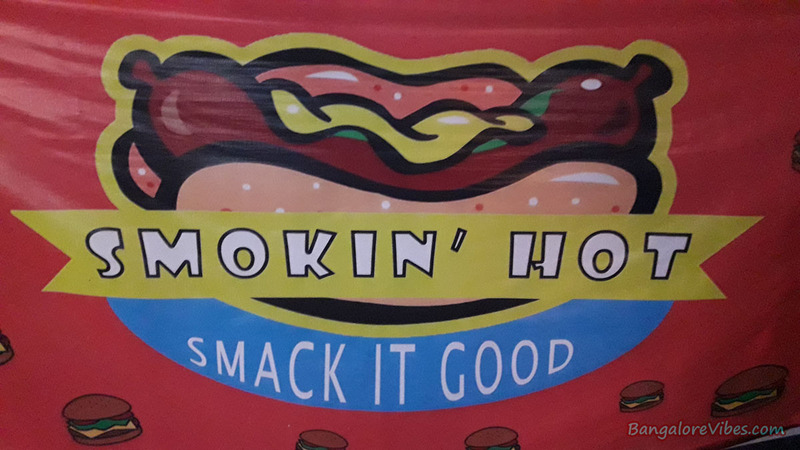 Nelson and Steve, after gaining experience in organizing open barbeques in couple of restaurants ended with their own stall – Smokin Hot Smack It Good. It is a wagon stationed in one place. They sell chicken burgers and hotdogs. They offer vegetarian version as well. They offer good chicken burgers and chicken hotdogs for the price they sell at – Rs. 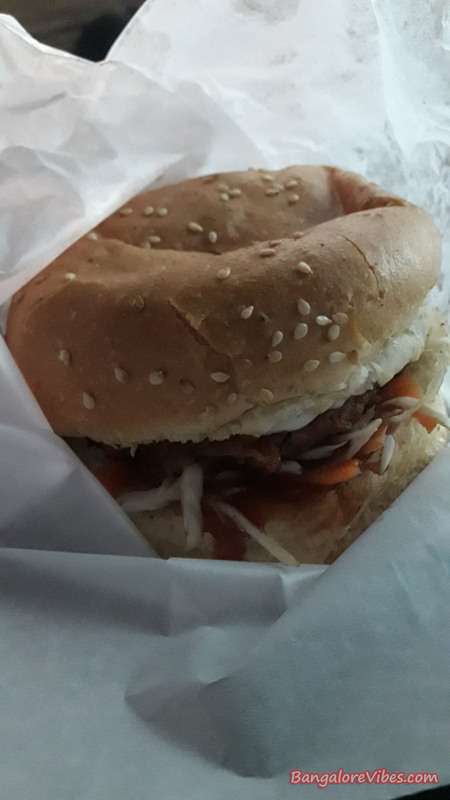 65/chicken burger (The burger called Master Piece). They sell higher version of the burger as well, I have not tasted that one yet. If all the ingredients are in place, setting up a chicken burger is an easy affair. I still feel this to be true. However, when I observed these guys preparing chicken burger, it was not an easy task for them and that is why those burgers are special. The Smokin Good wagon has a charcoal fired mini barbeque setup, custom made, that can grill at least four patties at a time. The meat that goes into burger and hotdog is a minced chicken prepared beforehand. You will not see sausage going into the hotdog bun. They make the patty or roll out of the minced chicken and cook it in the grill. It is a time consuming process. They heat the burger bun as well. Other fillings including the barbeque sauce and mayonnaise are ready. Once the minced chicken patty is cooked, the delicious chicken burger is ready in no time. The Smokin Hot prepares chicken burgers and hotdogs on order. The average wait is about five minutes or more depending on the customers waiting. The wagon is in Kammanahalli main road, little farther from Sukhsagar restaurant, towards KFC restaurant circle. Further Reading – Kammanahalli in Times of India.